“As noted in the old passport, the bearer has registered as an immigrant into Palestine…”. German Consulate General, 22 Sep 1938. Stamp. Page seven shows a USA immigration visa issued in Palestine on Oct 19, 1938. Page six has a handwritten entry of the German Consulate General in New York, without date, “Remark: The bearer also has the name ISRAEL“. 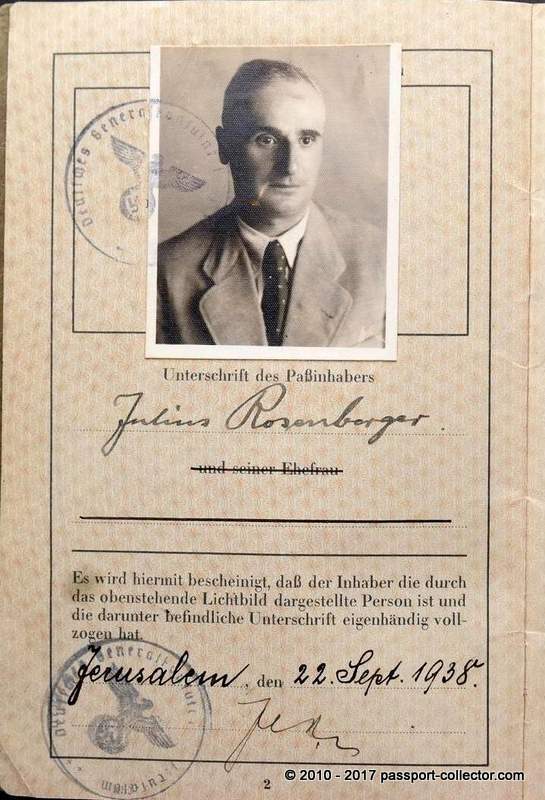 The J-stamp on page one has the date of Jan 31, 1939, and the stamp from the German Consulate General as well. A Palestine immigration stamp with date Nov 16, 1938, is at page nine, including another stamp with date Nov 25, but I can’t see where it was issued. He exits Haifa on Nov 24, 1938, arriving Marseille on Nov 30 as Transmigrant. The last stamp is from Bologne sur mer on Dec 8, 1938. Seems he never reached the USA, for whatever reason. 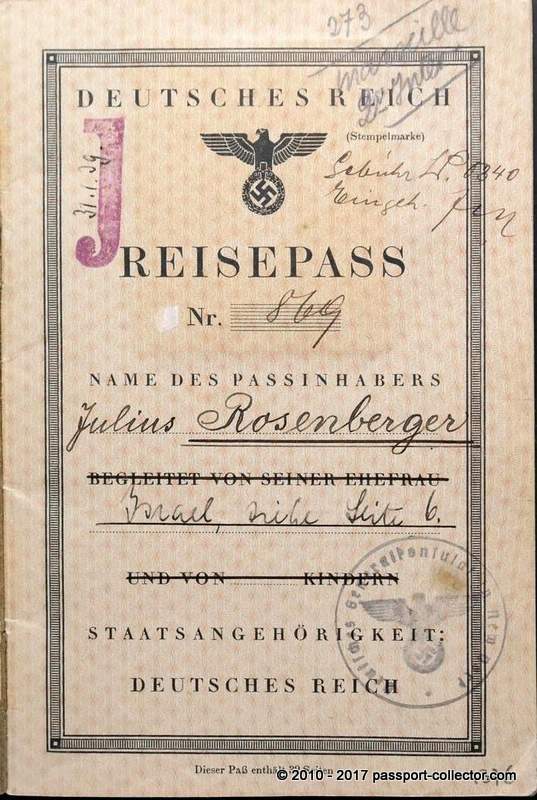 A great document of (passport) history and one of the last German passports issued in Jerusalem. Walter Döhle (born January 19, 1884 in Eschwege, Germany) was a German Consul-General in Jerusalem. Döhle had been a member of the Foreign Service since 1909, initially as a tobacco inspector of the Imperial Treasury in the Consulate in Rotterdam. In 1920 he became Secretary of the Legation at the Embassy in The Hague. From 1921 to 1923 he was at the Foreign Office in Berlin and from 1923 to 1935 at the German Embassy in Paris as a council of representatives. In 1934 he became a member of the NSDAP. In 1935 he became Consul General in Jerusalem. At this time, in contrast to the conditions in other countries, with the exception of Australia, very good relations developed between the National Socialists in Palestine and the German Embassy. Under his predecessor, Heinrich Wolff, who was relieved because of his Jewish wife, it was very different. In 1939 his term of office ended in the war and he was again in the Foreign Relations Department in Berlin in the economic policy department.